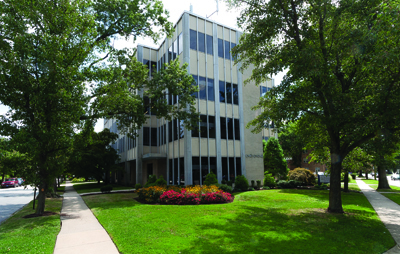 In mid-July, the entire Advancement Department—Advancement Operations, Alumni Relations, Alumni and Gift Records, Annual and Parent Giving, Donor Relations, Leadership Giving, Gift Planning, Research, Sponsored Programs and Institutional Research—moved to newly renovated office space in the Ville. The move finally puts all of the College advancement division in the same space. Come see our new library and check out our lovely view of Clothier Tower! Visit our new home in the Ville, on the third and fourth floors of 101 S. Chester Road. 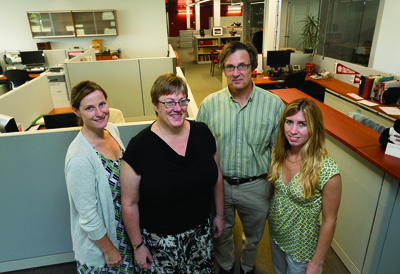 Alumni relations staff Wendy Waltman, Lisa Lee ’81, Geoff Semenuk, and Julie DiPietro have only smiles for their new workspace. Save the Date for the All-Alumni Sesquicentennial Reunion Bash!